Music, aviation, woodworking, photography . . . and more!! I’ve flown this around hallways at work and the local parking lots for over 8 years now and I’m not even sure you can buy them from Tyler any more. There are lots of pictures and plans on the web though so you shouldn’t have any problems coming up with you own plane if you wanted to try to duplicate what I’ve done. It’s a very cool unit comprised of a 2.7V, 10F (yes FARAD, not microfarad) ultra capacitor and a 14mm X 5mm electric motor mounted on a very thin, square, carbon fiber “pulltrusion” tube. 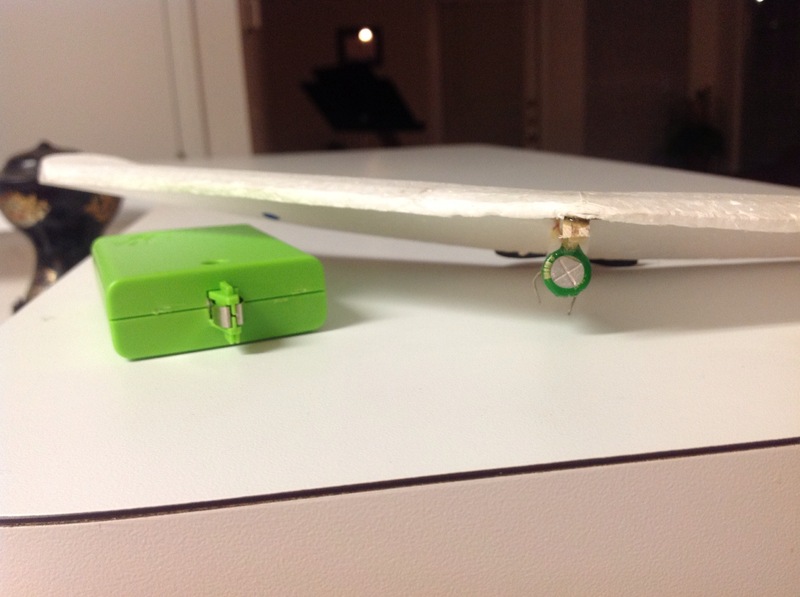 You clip it onto your favorite paper airplane, charge up the capacitor with the hand held battery pack (3-AA batteries) and let fly. I flew a lot of paper airplanes before it hit me . . . the walk along glider! 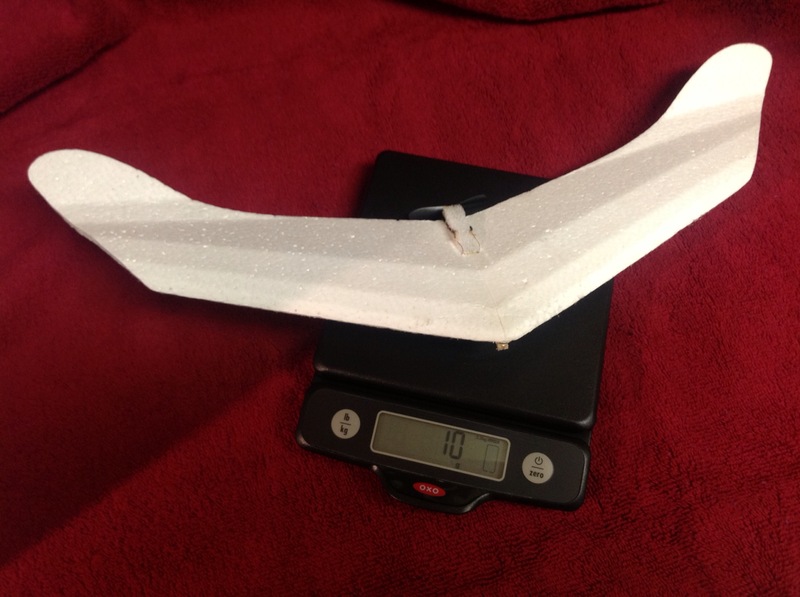 Initially, I epoxied a balsa keel to the bottom of the wing and tacked the PowerUp unit to it. This setup made it hard to change the thrust line and gave only OK performance – it was a bit heavy. After messing with it for several weeks I bit the bullet and went on a weight reduction spree. A set of small diagonal cutters made quick work of freeing the motor and capacitor from their plastic mounts. I then cut the wires – making sure to leave enough lead length for later soldering – and extracted them from the tube. Keep the tube, it’s incredibly stiff and makes a great stabilizer or fin spar. 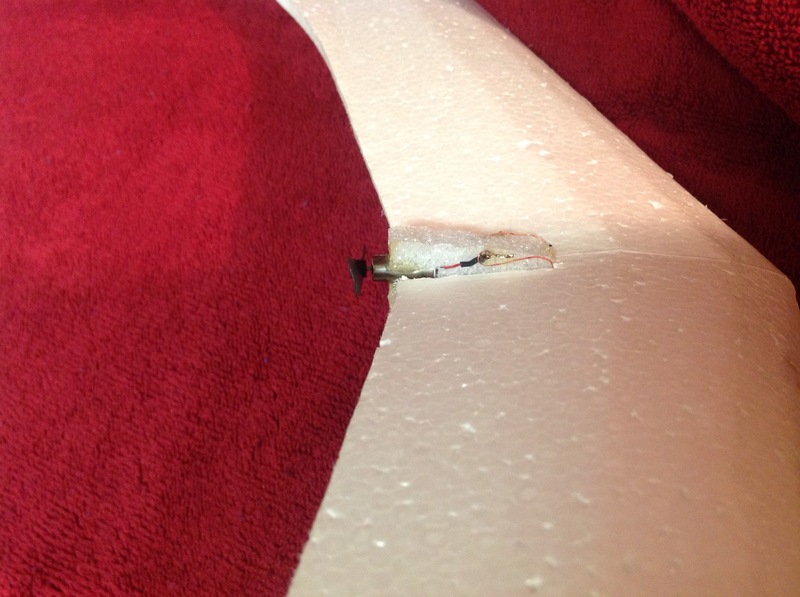 I trimmed the keel level with the bottom of the wing, notched out the trailing edge to accept the motor that was now mounted in some packing foam, routed and re-soldered the leads from the capacitor to the motor, and tacked the whole thing together with a minimal amount of 5 minute epoxy applied from the tip of a toothpick. Note that the motor is tacked into its slot with a tiny amount of epoxy but that the block itself is only glued at its leading edge. This allows the block to flex up and down slightly for thrust line adjustments. No sophisticated charging jack is needed just apply the metal contacts to the leads of the capacitor and count to twenty. The capacitor isn’t polarized so it’s possible to accidentally reverse the charger and get the motor to run backwards. Just let it run down and recharge with the correct orientation. I’ve only flown this in large rooms and outside in a parking lot in absolutely dead air (one time at 1:00AM I amused a local police officer with several flights). Adjust the thrust line for a gentle climb and tweak a wingtip for a wide left turn. 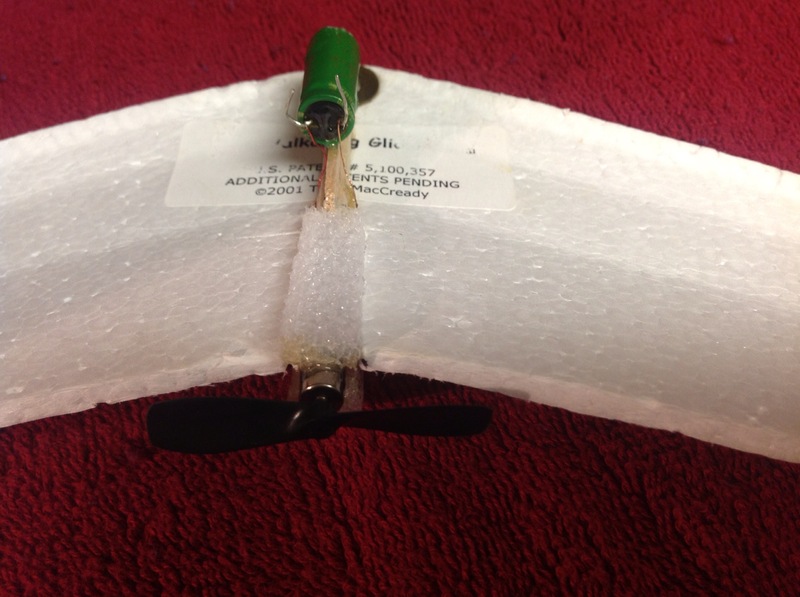 I can easily get 30-45 second flights from it and have had a couple of 60-90 second flights. Here are some pictures and if I can get someone to video a flight I’ll post it. By the way, that’s 10 grams showing on the scale.